Finding ready to go low carb and keto friendly treats and snacks like keto candy isn’t always easy! You can’t always run out to your local grocery store like you can to get carb filled desserts and foods. Fortunately you CAN kick your sugar habits when switching to low carb and keto with these alternatives you can purchase online. Fortunately the internet makes it a piece of cake to find low carb and keto friendly snacks for those times we simply don’t want to make it ourselves. Here’s a list of 14+ highly rated low carb, sugar free and keto candy ideas you can buy to have on hand at home for those times you want to satisfy that sweet tooth without cooking. These yummy keto candy options also make it easier to stick to your ketogenic plan during the holidays and around special occasions. 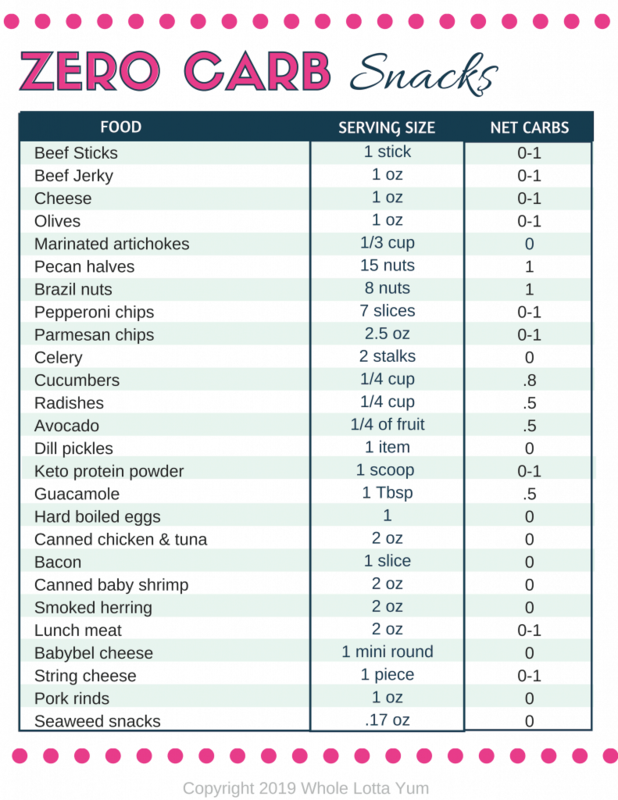 NOTE: Keto candy still has it’s place on a ketogenic diet, but please eat sparingly since they still have more carbs than eating parmesan crackers or even a handful of keto chocolate chips would be. Is There a Keto Friendly Candy? You might be wondering if you’re following a keto diet whether you can even eat keto candy. Is that such a thing? A standard ketogenic diet allows you to consume 20 net carbs per day, so in theory, an occasional piece of keto candy can play apart of that. The important thing is to just eat approved sweet treats in moderation or you might not reach ketosis or you’ll kick yourself out of ketosis. What are the Best Keto Sweeteners? The BEST keto sweeteners also use erythritol or stevia, since these have the lowest glycemic impact. The sugar free, low carb and keto candy on our list varies with the type of sweetener used, but most are erythritol or stevia. We’ll let you decide which ones of these work best for your specific health needs, depending on if you’re looking for keto candy, low carb, or sugar free candy to purchase. Some of the sweetener types on this list are perfect for someone looking for low carb and sugar free candy, whether some of those sweeteners are something for a Keto Diet is for you to decide. For a keto diet, sugar alcohol gets subtracted from the carb count since it has minimal impact on blood sugar levels. For example, if something says 12 carbs but then shows 12 grams of sugar alcohol, the net carbs is ZERO. Disclaimer: Some sugar alcohols that come from sweeteners Maltitol cannot be subtracted from the total carbs. If you’re in a hurry and want to know what the FAVORITES are, here you go! Can anything get better than dark covered chocolate almonds with sea salt? Like seriously! What we especially love about this Choc Zero low carb and keto candy is that it has only 2 net carbs per serving and zero sugar alcohol! Sweetened with monk fruit. 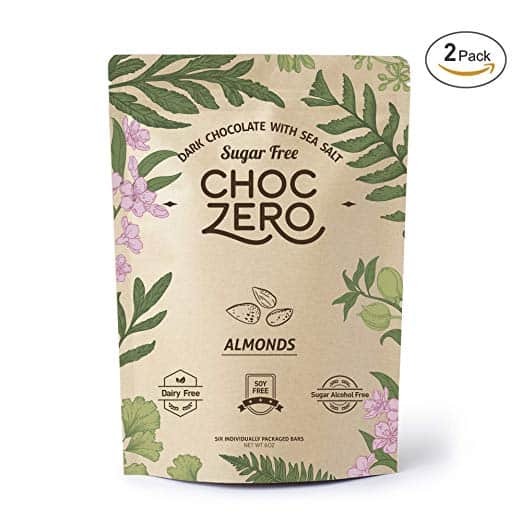 Choc Zero also makes keto coconut bark and dark chocolate covered hazelnuts too. Notty makes 6 amazing varieties of popular low carb and keto candy bark that sells out like hot cakes. Smart Sweets ~ 4 Varieties! 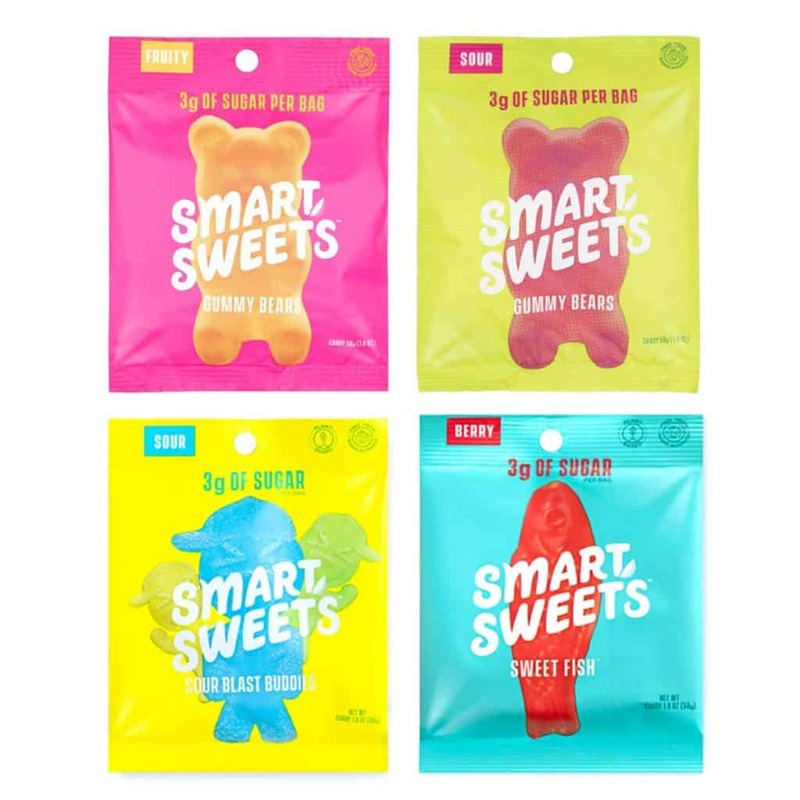 I’m sure you thought that by following a low carb or Keto Diet you’d have to give up yummy candy like gummy bears or Swedish Fish, fortunately Smart Sweets has a highly rated line of keto candy sweetened with stevia you’ll absolutely go crazy for. Smart Sweets Gummy Bears come in either sour or fruity versions, depending on your mood and cravings. These are actually one of our favorite keto friendly candy options, especially the Swedish fish! Those are the best 😉 If you live near a Whole Foods you can buy them there in single packages. Online you can buy a 12 pack of your favorite low carb and keto candy OR you can buy this awesome variety pack so you can try them all! Smart Sweets makes berry flavored Swedish fish, fruity gummy bears, sour gummy bears, our sour blast buddies. 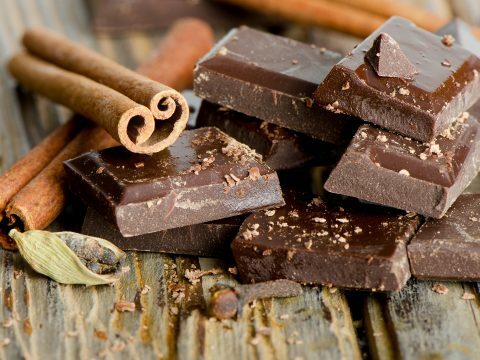 Lily’s chocolate is probably the most well known keto friendly chocolate producer, especially their Lily’s chocolate chips (which taste just like the real deal!) Lucky for us, they also make a variety of keto chocolate candy bars too. Sweetened with Erythritol. Lilys chocolate bars ARE. TO. DIE. FOR…..they far exceeded expectations when I recently bought one. The only downside? It was hard stopping at just one little piece and I’ll admit I consumed the entire bar. What’s even better is you can buy them in bulk and get a variety pack. 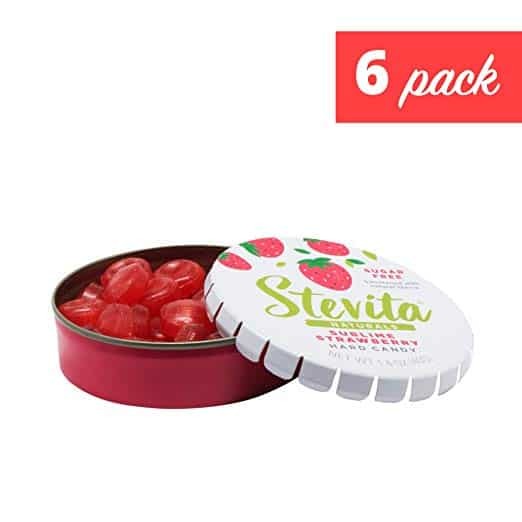 Stevia makes a stevia sweetened hard candy that only has 1.5 grams of carbs per piece of candy. You’ll love this tasty strawberry flavored treat that also comes in grape and cherry flavors. NOTE: In addition to stevia, these tasty hard candies also contain a little isomalt, which is also a sugar substitute. 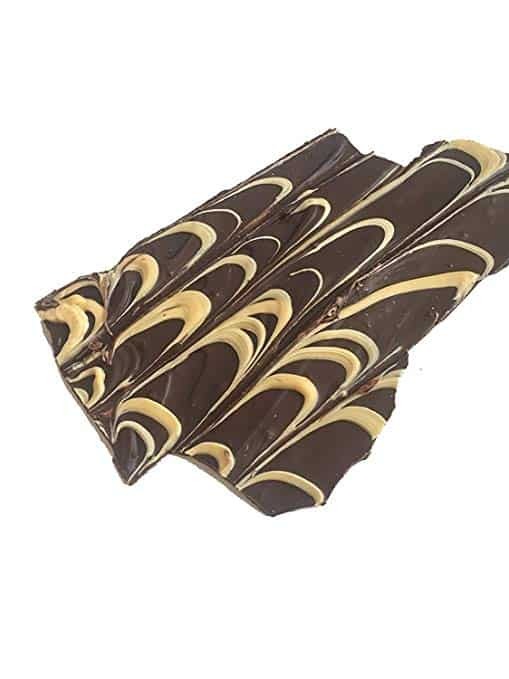 Mouthwatering chocolate and peanut butter definitely go hand in hand, you’ll love this peanut butter milk chocolate candy bar by ChocoRite. Only 2 net carbs per serving! Sweetened with Erythritol and stevia. Just when you were thinking you’d have to start making your own fat bombs, Keto Squared came out with a line of ready made fat bombs. Whether you want a tasty keto treat or sweet snack, you’ll love having these as an option! This amazing keto candy is sweetened with monk fruit. The fat bombs com in either a macadamia creme favor or chocolate dream. ChocoRite also makes tantalizing chocolate caramel turtles that will surely become your go to treat when you’re trying to beat sugar cravings. Sweetened with erythiritrol. These would make the perfect low carb sweet treat to serve to your friends and family also! While a protein bar isn’t technically a keto candy, when you look at the list of Quest bar flavors you’ll most definitely want to consider them when you’re craving something sweet. We LOVE this variety pack option that includes flavors such as peanut butter cookie dough, cookies and cream, cinnamon roll, and milk chocolate chunk. Our favorite is the chocolate chip cookie dough, what’s yours? Atkins Endulge includes a fantastic line of low carb candy, including these chocolate candies that taste like the real deal. The closest thing to M&M’s and only 1 net carb per serving! The Atkins Endulge line can also be found in places like some grocery stores, Target or Walmart. If you’re like me and prefer to stock up in bulk, buying online is the best way to go. What’s important to be aware of with the Atkins line is that the front of the box says they are 2 net carbs per serving. However, if you’re on a strict Keto Diet, please be aware that this low carb candy does include Maltitol, which keto followers say can’t be (or can only be 50%) deducted from the total carbs. 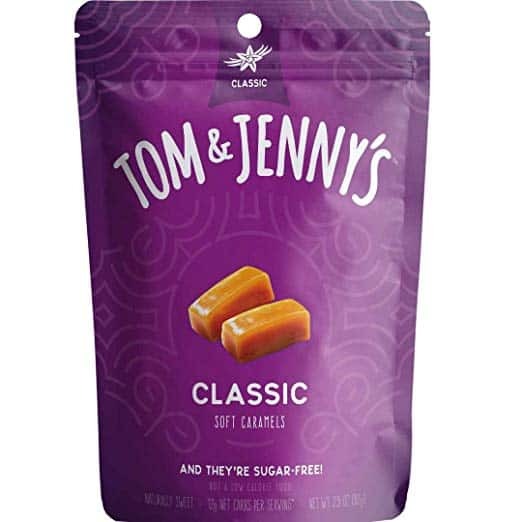 Tom and Jenny’s low carb caramel candy comes in 5 different flavors! These are very highly rated and sell out super fast. This lower candy is sweetened with Maltitol and xylatol, which Maltitol is NOT considered a keto sweetener. 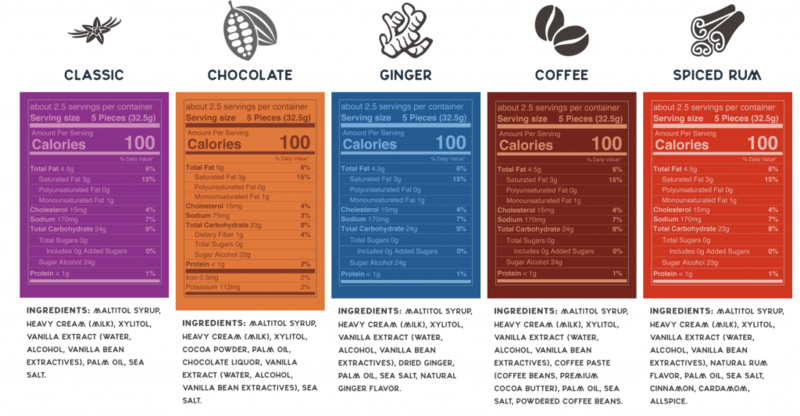 Typically you can deduct the fiber + sugar alcohols from the total carbs to determine the net carbs for a food. But because Maltitol doesn’t break down like keto sweeteners such as stevia and eurythritol, you can’t deduct the full amount of sugar alcohol from this candy. Some reports say 1/2 of the Maltitol sugar alcohols can get deducted from the carbs, others say none. Tom and Jenny’s caramels come in classic flavor, chocolate, ginger, coffee and spiced rum. 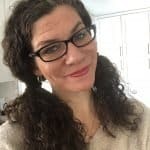 If after going through this comprehensive list of keto candies on the market you’d rather make your own keto candy and treats, make sure to check out these posts! I can’t have or splinda or stevia. I have an allergy. Sugar alcohol don’t seem bother . do you have a quick link to those candies?